Cynthia joins several SDA members at the Biennial Fiber Art Show in Tacoma sponsored by American Art Company. For more information , click here. 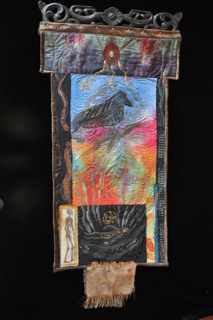 "Guardian" - 39 x 16 - Silk, cotton, hand dyed, discharged, machine and hand quilted. This entry was posted in Exhibition. ← Two Fiber Artists to Show in Langley this Weekend!